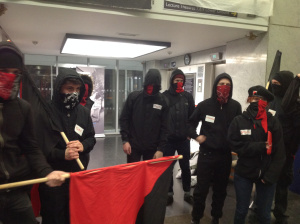 The group, which includes activists from Sheffield Autonomous Students, Revolutionary Socialists Society, Labour Students, Socialist Students and the Living Wage campaign, walked into the lecture hall at about 7:30pm and have now claimed a major lecture theatre and the building foyer. In their statement, the student activists also distanced their tactics from those of the striking trade unions. Although the occupation is in solidarity and support with striking staff, the occupiers have emphasised that it is not condoned by any trade unions. Students have negotiated with security guards and decided that only three guards will be allowed into the building at any one time. The police arrived at the building earlier this evening, but have since left after speaking with the head of university security. Our occupation will further disrupt the running of the University on a day when we believe no staff and no students should be crossing a picket line.